Inventory We are a resale marketplace, not a box office or venue. Ticket prices may exceed face value. This site is not owned by Bill Graham Civic Auditorium . The historic Bill Graham Civic Auditorium has been one of the premier venues in San Francisco for almost 100 years. The arena is a part of the San Francisco Civic Center and opened in 1915. Bill Graham Civic Auditorium was home to the Golden State Warriors from 1964 to 1966. 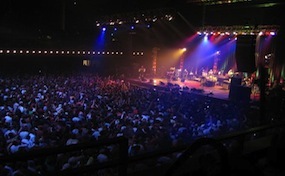 The Bill Graham Civic Auditorium box office is located at 99 Grove Street in downtown San Francisco, California. Bill Graham Auditorium tickets recently have included concerts like Bob Dylan, Santana, The Killers, Smashing Pumpkins, Phish, and many more. AuditoriumSanFrancisco.com is an independently owned and operated company that specializes in all online resale tickets in the secondary market. We are not currently affiliated with any official box office, website, and or venue. Ticket prices on our sites may be well below or above face value and can change quickly with market conditions. To order tickets to all Bill Graham Civic Auditorium San Francisco events please follow the steps online through the checkout or call our operators for further assistance.